What happens when you mix 'Contra' with ' Shadow of the Colossus? The creator of 'Gunman Clive' has the answer and its just as brutally hard as you'd imagine. When you think of run-and-gun games like ‘Probotector’, ‘Metal Slug’ and ‘Gun Star Heroes’ it’s not the levels you remember. It’s the moment a robot burst through a wall, it’s that screen filling tank that’s seems indestructible, it’s the robot spider who must be taken apart limb by limb. For many epic boss battles are the reason to play these style of games. 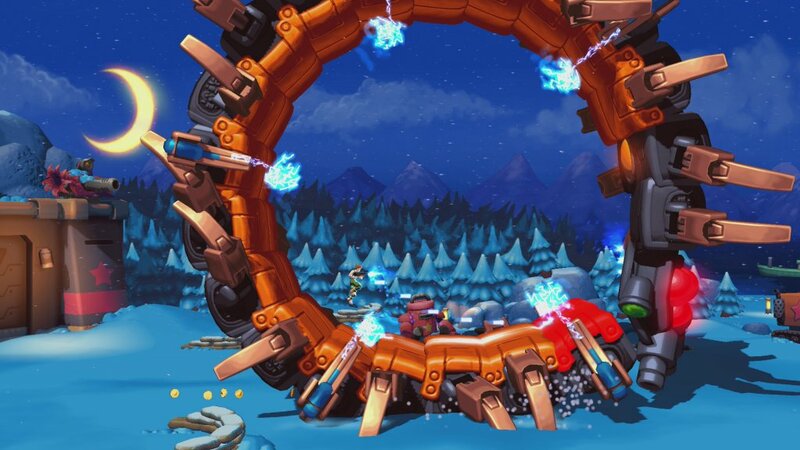 The greatest joy of a ‘Mega Man’ game is finally defeating the robot masters. You punch the air with joy either when you find the weapon they’re weakest too or once you’ve memorised their attack patterns and leant when the most opportune moment to strike is. If players didn’t enjoy just fighting the end of level bosses there wouldn’t be the inclusion of “Boss Rush” mode in so many games. This often imposing challenge demands players just fight all the bosses with none of that level nonsense getting in the way in between. You may have energy restored after each battle, but if you don’t it just adds to the challenge. Recently games like ‘Cuphead’, ‘Titan Souls’ and ‘Furi’ have shown there’s demand to turn what was once a bonus element of a game into the main focus. 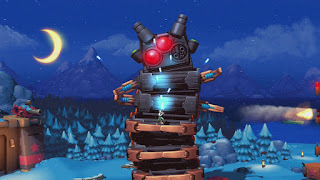 But unlike these games where success when fighting a giant foes comes from Mastering the ability to dodge attacks and retaliate, ‘Mechstermination force’ sees you leap onto them, expose their weak point and then focus attacks on it. The gameplay is perhaps best described therefore as a 2D ‘Shadow of the Colossus’. Designer and Game Director Bertil Hörberg notes the similarity. “While I [acknowledge] ‘Shadow of the Colossus’ there isn’t really that much direct influence from it other than the general concept of giant bosses that you have to climb on”. The game consists of 14 boss battles. Resembling the Mecca of eighties anime, each represents a standalone battle. All attack differently but the first thing you should do is weaken their defences. Armed with a multi-directional gun, blowing apart armour typically exposes large red buttons that must then be struck from close up using a melee attack. Annoyingly, while some can be hit from the ground, typically you can only reach the weak points once you’ve mounted the mechanical beast. Foolishly it’s their own attacks that make this possible, as the robots slam their mechanical limbs against surfaces in an attempt to crush the player. Your success depends on dodging this and then launching a counter attack; sprinting along their arms or clambering up bodies, exploiting the robot’s moments of respite between each attack. As the game progresses the weak points become harder to uncover and the methods to then get to them become less obvious. 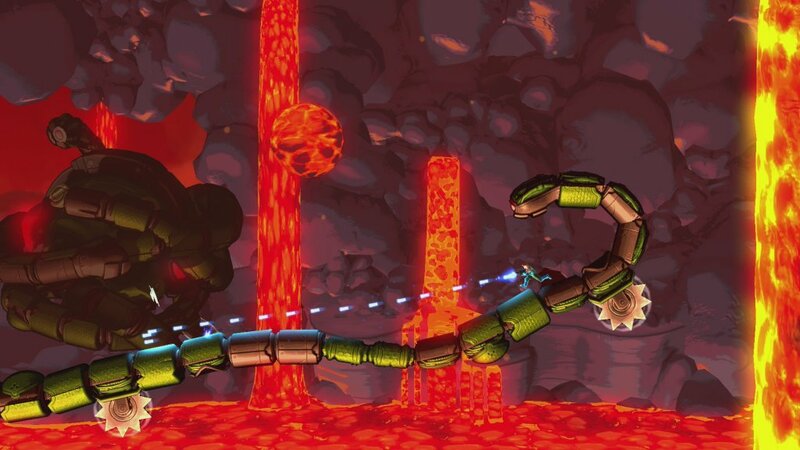 While early easy bosses involve a single climb, later stages require multiple leaps and precise timing. Level layouts and appropriate use of weapon upgrades also quickly become considerations as you swing and fly around the imposing robots, deftly dodging their projectiles and flailing limbs. 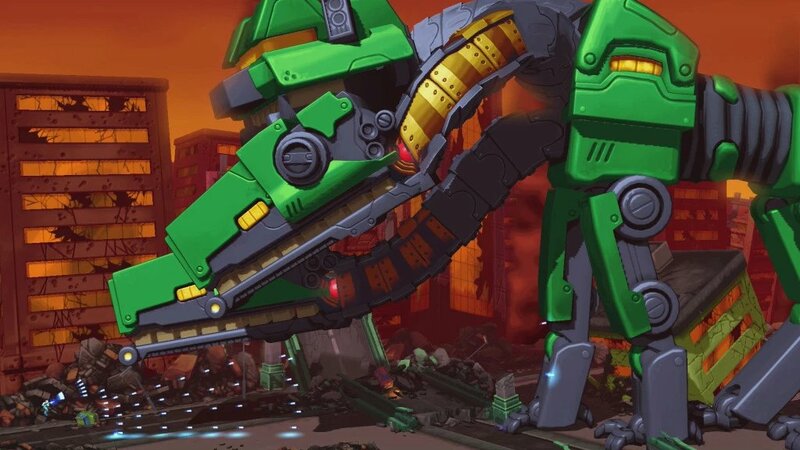 However as gigantic as they may all be, each of the Mechs can be downed in a matter of minutes. “Most of the bosses can be beaten in under two minutes once you’ve learned their attack patterns [and] mastered the timings, but it will take a few attempts before beating them” notes Hörberg. 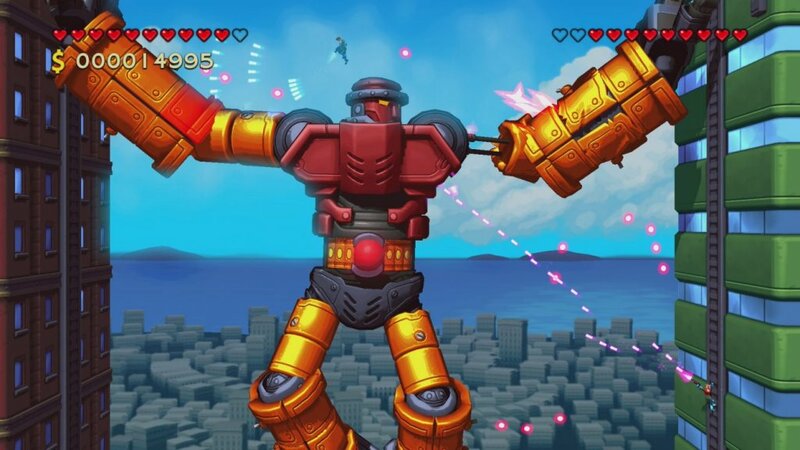 However the beauty of ‘Mechstermination Force’ is its ability to make each boss feel imposing yet still beatable. With each attempt the process you need to employ becomes clearer, there’s continually the sense you’ll down them on the next go. “I’ve tried not to make it too hard-core and frustrating but at the same time give a decent challenge and a satisfying experience, which is a tricky balance” says Hörberg. Although each attempt may not be successful it isn’t just knowledge you acquire from a failed battle. As the bosses weaken they drop coins which are kept even if you die collecting them. These coins can then be spent in a shop, improving your character for a subsequent try. Hearts can be bought to increase health , additionally weapons and new abilities can also be purchased greatly increasing the likelihood that you’ll dismantle the colossal robots when you next duel. The upgrades will certainly feel familiar to aficionados of the genre. “Some of the weapons and bosses borrow a bit from ‘Contra’ [...] along with other games like ‘Gunstar Heroes’ and Treasure games in general” Hörberg admits. Alongside upgrades such as triple shots and flame throwers, you’ll also gain equipment such as Boost Boots for double jumps and Magnetic Gloves that grants the ability to cling onto surfaces. The inclusion of the latter shouldn’t come as a surprise considering that the designer of ‘Mechstermination Force’ had previously worked on two ‘Bionic Commando’ games at Grin. ‘Mechstermination Force’ quickly becomes brutally hard and certainly isn’t suited to a player that can’t control their frustration. If you do get angry playing games, this one isn’t for you – unless you can justify the price of replacing the Pro-Controller you’ll inevitably throw at the wall in frustration! Sometimes deaths are completely unavoidable, sometimes your character will fail to grab a ledge for no obvious reason, sometimes the recoils from hitting a weak spot will throw you directly into a pit. Sometimes this game is downright unfair, but really that’s also true of the games its inspired by. On the plus side, at least you know that each failure earned you some coins at the very least. Despite the fact you’re essentially doing something very similar for the majority of the time, ‘Mechstermination Force’ never feels that repetitive though. ‘Mercenary Kings’ certainly outstayed its welcome, with its bloated game duration artificially elongated by having to repeatedly play near identical missions. At around 5 hours ‘Mechstermination Force’ meanwhile seems to prioritise variety over game length and every boss is clearly distinct. Many also have evolutions, so battles can consist of two or even three phases. Of course, it would be preferable to continue from the last phase of the battle after death. It psychologically feels like a back-step having to return to the start of a boss every time you retry. However, you’ll soon become so adept at beating earlier phases you’ll wonder why you ever struggled with them in the first place. Once beaten, every stage can be replayed, be it to farm coins or to beat your personal best. As Hörberg observes “the game saves your clear time for the bosses and you can try to get three stars on ever boss by beating them under a certain time”. Intriguing the game’s last stage represents a huge gear shift, playing more like a bullet hell shooter, than a ‘Contra’ style run and gun. 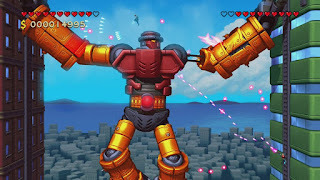 Considering Bertil Hörberg’s previous game ‘Gunman Clive 2’ ended with a giant screen filling Robot boss (that reappears in this game), perhaps ‘Mechstermination Force’s last level is a hint at what’s to come next from Hörberg Productions. ‘Mechstermination Force’ also offers a two player co-op mode, but by the designers own admission this was an unplanned addition. “Honestly most of the game was designed mostly with single player in mind. There are a few cases where the bosses change their behaviour a bit when playing in co-op, but a lot of the time the added chaos you get from having a second character balances out the benefits you get from the added firepower”. The game works with two but when the action on screen gets too frantic it becomes hard to tell what’s friendly fire. The inclusion of multiplayer did create the need for a choice of characters though. “The main reasoning behind having multiple characters was really just that we needed a second character for co-op” admits Hörberg. “I felt we might as well do a few more to give the players more options.” The four playable characters behave identically, so your selection is down to which appeals most visually. In fact a fifth playable character can be unlocked if you have a save for ‘Gunman Clive HD Collection’ on your Switch. Hörberg's earlier side scrolling action game series is celebrated for its visuals; a sketchy hand drawn monochrome appearance that adds a great deal of style to what is otherwise a fairly generic action platformer. Sadly the look of ‘Mechstermination Force’ is far less original. 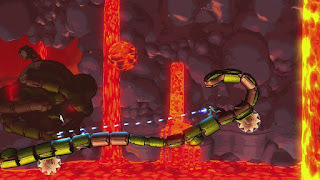 Similar to ‘Mega Man 11’, players control a 3D character in a 3D environment but one that’s viewed from a fixed side on perspective. It’s functional rather than stylish; it’s not bad, it’s just bland. However with such huge robot enemies the playable avatar ends up relatively small in comparison. While this isn’t a problem when the Switch is docked, when playing in handheld mode often the camera pulls back so far it’s hard to determine which direction your facing. With such tiny characters it’s also hard to appreciate the hand painted textures, but thankfully frame rate never seems to dip below 60fps. Tragically the animated cut-scenes of the trailer are missing in the finished game, and with their absence the hope of a complex narrative is dashed. 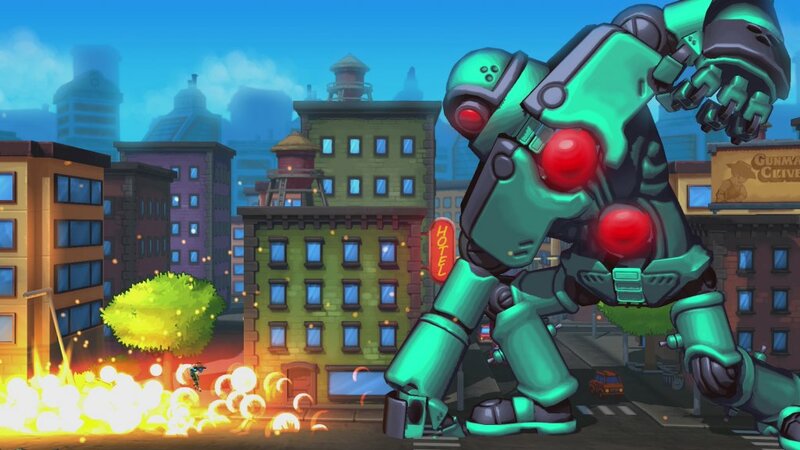 A simple “save the world from gigantic robots” premise is set up at the start, but there’s very little development of this throughout the game. If ‘Shadow of the Colossus’ was an influence, it wasn’t the powerful emotive story telling of that game that inspired Hörberg. 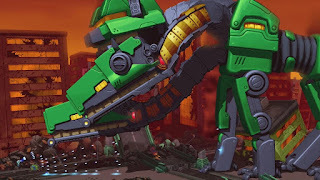 ‘Mechstermination Force’ feels and looks like a Saturday Morning cartoon from the 80’s; all spectacle with little in the way of story. The music too is reflective of this time. It’s excessively dramatic and heroic, but pleasantly drowned out by roaring explosions and the pew, pew, pew of your futuristic weaponry. With so much going on when playing, its likely you won't even register that there is in game music. Because of this, a jukebox can be found in the in-between-level hub for you to listen to the game's tunes in a more relaxed manner. I doubt ‘Mechstermination Force’ will gain the cult following that ‘Gunman Clive’ now enjoys, but there's almost certainly a specific audience that will adore it. It’s a quick, accessible albeit it insanely hard game ideal for both speed runners and those who have a half hour to fill on a journey to work. Its bright colourful over the top and downright silly, but these are also the very qualities you would expect from a game with such a deliciously pun filled name. Yes, it may only be a collection of very hard boss battles, but were these bosses included in a traditional run-and-gun action game they’d likely be your favourite parts. A digital copy of ‘Mechstermination Force’ was given to review. No one has seen or had any influence on the content of this post prior to publishing.